The Unicorn Clan are strangers in their own homeland. After centuries spent traveling the world in service of the emperor, many eye them with suspicion and curiosity, their gaijin customs an oddity in the Emerald Empire. Forced to teach their strange meishōdō magic to the rest of the Emerald Empire, the Unicorn are desperate for allies. That is why Unicorn Clan Champion Shinjo Altansarnai’s refusal to marry the Lion Clan’s Ikoma Anakazu came as a shock to many. Not only would the marriage have interlinked the two clans in a strategic alliance, the refusal puts the entire Unicorn Clan in a bad light in a world where honor is stronger than steel. Now Ide Tadaji travels to the imperial City of Otosan Uchi to relay Shinjo Altansarnai’s decision to the throne. What response will the Imperial Family have, and how will this decision impact the rest of Rokugan? Fantasy Flight Games is proud to present "Flying Chariot, Standing" by Gareth-Michael Skarka, a new piece of fiction set in the world of Legend of the Five Rings! Flying Chariot, Standing focuses on the Unicorn Clan, following up on plot points found in “Curved Blades,” and can be downloaded here (1.3 MB). 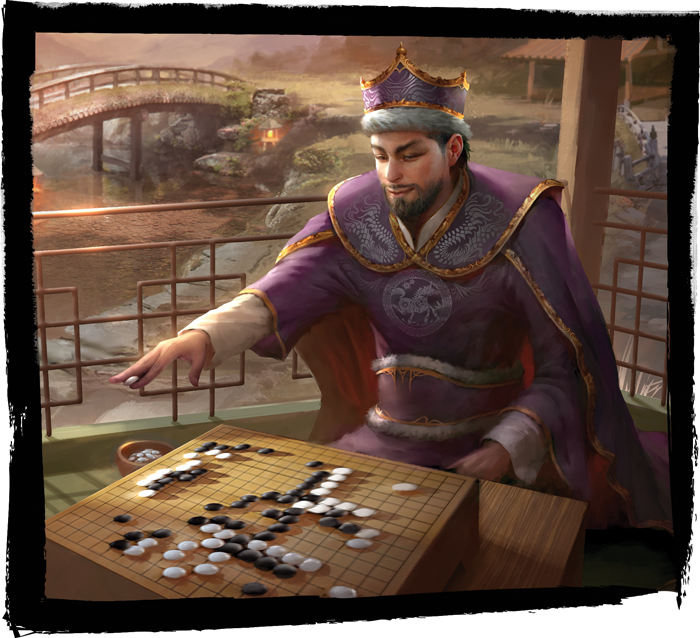 Be sure to check back every week during the Imperial Cycle for more Legend of the Five Rings fiction as well as previews for Legend of the Five Rings: The Card Game and Battle for Rokugan! Draw your blade and pre-order The Chrysanthemum Throne (L5C05) from your local retailer or our website here!